In 2019, mobile innovation is far stronger than ever, as many technologies have marched into the market including-5G, edge-to-edge display, foldable screens, etc. Now guess what big has happened, Yes from the big we mean Google’s new feast. The long-awaited Google’s Android Q Beta 1 has finally arrived. Now the time has come where we all can put our fingers on the pulse of its latest features. Now, Android app developers have new opportunities on their way- they can test the upcoming OS version on their device & able to contribute to implementing & improving its features & functionalities. 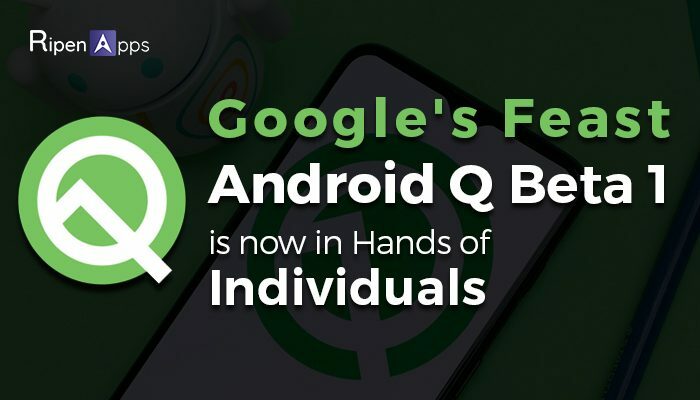 Google released its Beta 1 of Android Q for early adopters & a preview SDK for app developers. One can leverage the competency of Android’s new release now by enrolling any Pixel device- Original Pixel & Pixel XL along with some extended devices- Oppo, Nokia, Xiaomi & Vivo. Now, there is an extra treat, which every android developers, as well as users, can have in the form of additional security features, enhancements for foldables, new APIs for connectivity, new media codecs, and camera capabilities and considerably more. For more exciting features that everyone wants to have in their hands are. Android Q enables users to give apps permission to see their location never, only when the app is in use (running), or all the time (when in the background). Now the users can unfold some security features from- accessing the app’s data with permission to tracking the app’s access to the images and videos. 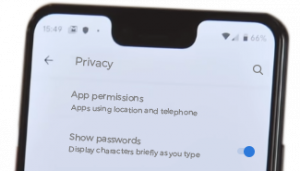 Some other privacy features have arrived as if a cheery on the cake by Android Q- Android Q Beta has provided the limited access to device identifiers like serial numbers, IMEI, etc. Along with the security and privacy factors, Android always carries new & exciting user-engaging features that get more eyes towards the latest release or Apps; Android Q Beta 1 come with the most exciting feature in the form of Foldables Screens. While utilizing Android Q, the Android app developers will almost certainly deal with the way their apps will be shown on the extensive and foldable screens. The foldable devices have cleared ways for various use-cases and creative experiences. To empower the users to benefit as much as possible from these advantages and a few other substantial screen devices, Android Q has been overhauled with a couple of enhancements like changes to onPause and onResume for supporting multi-continue, and so forth. To enable users to oversee how his/her app is being shown on a large and foldable screen, Android Q has likewise changed how the resizableActivity shows unique property works. Android Emulator has also been refreshed for supporting the multiple-display type switching. The progressed Operating System of Android Q Beta enables a user to control an app in discovering his/her ideal areas. For example, when an app is searching for a user’s area for item delivery, it will bode well, and the user may enable it to do that. With a more prominent arrangement of authority over such things, the clients will positively appreciate utilizing Android Q. 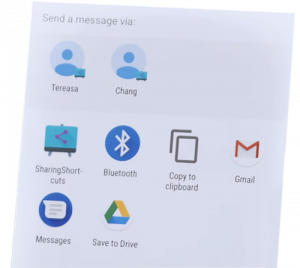 Sharing will become more accessible than ever, courtesy the Sharing Shortcuts of Android Q. This alternative will enable the users to change to another app for sharing content individually. The developer would now be able to distribute the mutual targets, which launch a specific action and these can likewise be shown in the offer UI. With Google’s new treat in the form of Android Q Beta 1, it is possible to show key system settings directly in an app’s context just because of the brand new Setting Panel API. With Android Q Beta 1, Apps will obtain the competency to request the Dynamic Depth images, which consists of XMP or JPEG metadata for the depth elements as well as the confidence maps included in the same file. Android Q Beta 1 release increases the plausibility of providing Bokeh effects & more personalized Blurs in diverse apps. In the future, it would be possible to churn out 3D images & supporting AR photography. Android Q introduces support for the open source video codec AV1. This allows media providers to stream high-quality video content to Android devices using less bandwidth. Android Q Beta 1 keeps on boosting the ART runtime for aiding apps to perform with greater spryness, but utilizing less memory. Google Play has now conveyed the cloud-based profiles with APKs. By upgrading the Zygote procedure, Android Q Beta can start an app’s process and move it to a security container with the goal that it can buck up right away. Opening apps have turned into significantly quicker and more comfortable as Android has become familiar with those pieces of an app’s code that can be utilized commonly. 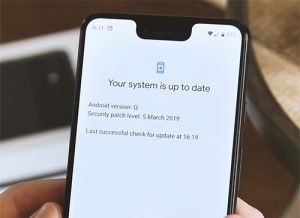 With the introduction of Android Q Beta, the new-age developers have earned the capacity to process app information prior and along these lines send it to the security holder, so it turns out to be entirely prepared for launch. Android Q Beta 1 guarantees elite just as a low-latency mode for various remote associations. This can profit the improved voice calls and real-time gaming as it were. By refactoring Wi-Fi stack, the Android Q can acquire a visible improvement in the execution and privacy of a device. Likewise, it can help the primary use-cases, for example, the administration of IoT devices and recommendation of various Internet connections sans requiring any location permission. As privacy is always the primary concern for every user as well as developers, Android Q Beta 1 is a particular release to getting started with testing right away. In particular, you’ll want to enable and test with Android Q storage changes, new location permission states, restrictions on background app launch, and restrictions on device identifiers. How to install Android Q in your device? The way toward install, Android Q Beta 1 on your device is straightforward. But, If you run over specific issues, you should reformat your device to return to an increasingly regular form of Android Pie. Thus, be set up for it. To back your device, open your Settings and tap on System. When done, hit on Backup button. The dynamic window will advise if when your phone is set for a backup. The initial backup would take a more drawn out time, yet it will be beneficial to get back your device data if anything turns out badly while installing Android Q beta or working with it. Google permits to take on the beta by logging with your Google account and picking the compatible device that you are having. With this progression, the OTA (over-the-air) update will be set up to roll out on your device, much the same as a stable Android OS version. Presently, you will be approached to tap on the “Enroll” button. When done, the update will start to take off on your Pixel Smartphone. This may take a half-hour or increasingly, about which you will be advised on the enlisted devices. At the point when the new Android 10.0 beta developer preview compasses to your devices, you will be approached to install, much the same as should be expected OS updates. Play out the needful, and with this, the Android Q beta has hit on your device. Appreciate the features and functionalities. Any query related to Android Q app development would be appreciated, so write us on sales@ripenapps.com. Prankur Haldiya, Chief Technical officer at RipenApps is connoisseur who has worked with manifold clients & has given his past 6+ years in making chartbuster apps for App Store/ PlayStore. He is involved in developing the company’s strategy for using technological resources, Evaluating and implementing new technology, systems, and infrastructure. During his career tenure, he has worked on diverse products for the iOS/Android platform of various domains such as Social Networking, E-Commerce, Point of Sale, Business, and Entertainment and considerably more.